As a high school science teacher and football coach in Caldwell, I am always looking for new ways to motivate students and athletes, and in particular to help them develop grit, and the skill of resilience. I’m also a second-year Teach for America (TFA) corps member, and through a TFA program called Acceleration Academies, I recently had the opportunity to expose nine of my students to an activity that gave them an immediate lesson in resilience and grit. I developed the idea for this Acceleration Academy to help analyze some of the challenges faced by many students in Caldwell. 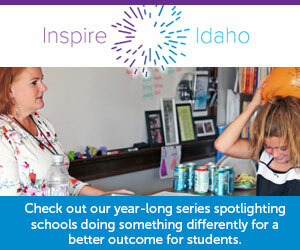 The district has a higher proportion of students eligible for free- and reduced-price lunch, lower attendance numbers, higher special education populations and decreased access to educational opportunity compared to more affluent Idaho school districts. What better lesson to impart than allowing them to experience grit in action – and to have some of it rub off on them? The Acceleration Academy I helped lead on a recent Saturday involved bringing the Caldwell students to Snake River CrossFit (SRCF), a community where I’m active, pairing them with adults, and putting them through a grueling team workout that pushed them to their limits. They loved it. And the adults, including a dozen of my fellow TFA corps members, benefited from it as well. At first, the students weren’t so sure. In fact, recruiting kids to participate proved challenging. Part of the reason for that, is that we deliberately kept our description of the day’s activities vague. We were determined to put them on the bus and take them somewhere new, outside their comfort zone. We wanted to model grit by making everyone experience discomfort together. The idea was for individuals to see how they communicate when in an unfamiliar place and out of their element. We wanted them to experience how barriers break down, how they can then commit to one another and keep pushing through and supporting each other in the face of tangible physical challenge. As a teacher leading peers during this Acceleration Academy, that was my primary intention: modeling and demonstrating optimism and how to positively interpret adversity, and then share that energy with and give that energy to students so they can overcome obstacles in their own lives. By the end of the Acceleration Academy, students and teachers together had done “sandbag bear crawls” with more than 1,200 pounds of sandbags, performed 1,440 burpees (a movement in which the athlete drops to the ground then rises up) and burned 1,000 calories pulling on rowing machines. There was shared sweat, frequent high-fives, and crisp communication. On the bus ride home, the kids were pumped. They wanted to know when we could go back, whether we could get some sandbags for our Caldwell High gym classes, if they could learn to lift weights like the athletes at SRCF. And mentors, from TFA corps members to SRCF athletes, had committed to working with Caldwell High students on an ongoing basis. We will be back at Snake River on March 10, pairing up students with athletes who have day jobs as educational leaders, EMTs, accountants, firefighters and entrepreneurs. Care to join us? Just keep an eye out for soaring sandbags, drafting dreams and a crew of gritty Caldwell kids. Written by Justin Frost, a physical science teacher at Caldwell High School.